The one bright spot in the story was the appearance of Carol Burnett as Sue’s dictatorial mother, Doris, the “famous Nazi-hunter.” It’s easy to see where Sue (Jane Lynch) gets her bullying attitude. Doris started tearing down Sue from the first sentence out of her mouth. And while Doris felt that Sue had shut her mother out of her life, Doris was reluctant to share any details of her own. (In fact, I began to doubt that she has been hunting Nazis all this time.) And I was not familiar with the song “Ohio,” or the fact that people wrote songs about Ohio. Notice that Sue’s father did not appear. I’m guessing the show is holding him back for next season. This week’s WALKING DEAD continued to expand on the theme: “We have met the enemy, and they are us.” Even in a world overrun with flesh-eating zombies, the biggest obstacle is still our fellow man. 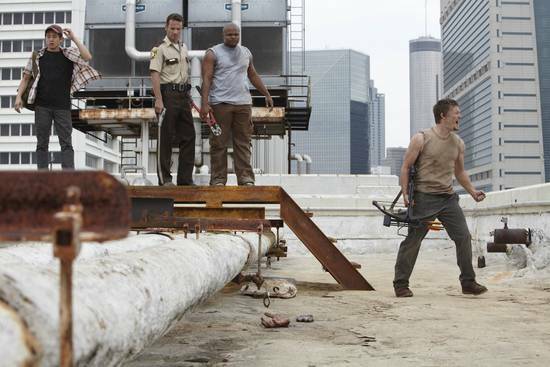 Rick (Andrew Lincoln), Daryl (Norman Reedus), Glenn (Steve Yeun) and T-Dog (Irone Singleton) set off to find Merle, but instead ran into a self-styled gang of tough guys who took Glenn hostage and demanded Rick’s bag of guns in exchange. You heard right: While the world was falling apart around them, Rick’s group faced off against a street gang over the bag of guns that Rick dropped back in the first episode. Instead of joining forces with Rick, Guillermo’s (Neil Brown Jr.) crew pretended to be gangsters and everyone risked killing everyone else. Which was insanely stupid; with the world collapsed, why fight for petty power and influence over a tiny band of survivors? At least Rick was simply trying to get his man Glenn back from the Vatos. In truth, Guillermo was a janitor before the fall, and his lieutenant, Felipe (Noel G.), was a nurse, and the Vatos were defending not gang turf, but an old folks home full of helpless, senile elderly patients.